Market Garden provides markets as a service for experimental research on smart energy systems. It is developed by the Intelligent and Autonomous Systems (IAS) research group at CWI. Contact: Michael Kaisers (kaisers at cwi.nl). Market Garden is running on our servers and provides market functionality as a service to partners. New markets can be instantiated in the cloud, and participants can connect remotely to trade energy. A parameterized family of default wholesale and balancing markets is readily available, and new market concepts can be implemented and tested within the Market Garden framework. Bidding strategies can be deployed remotely (e.g., at the partner's facilities) to trade energy or reserve capacity. A standard bidding behavior can be extended for custom needs. In some experimental local markets, a Distribution System Operator (DSO) can connect to the market to influence demand and supply matching in order to resolve local grid congestion. Market Garden can be used in conjunction with simulations and laboratory or field tests. 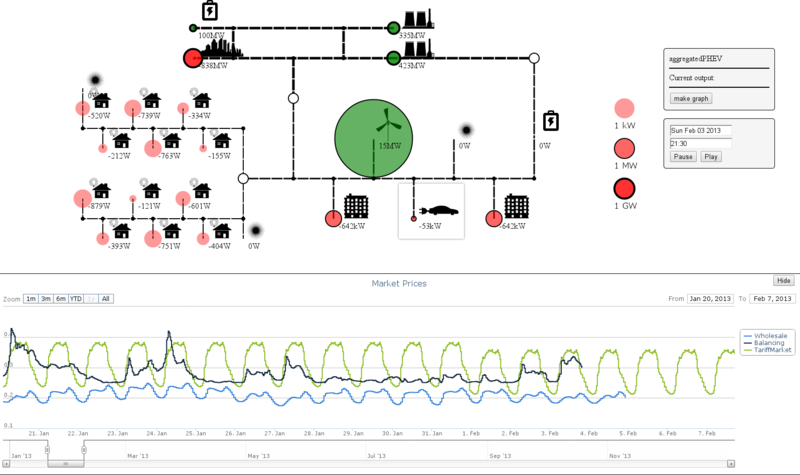 For simulation, a dedicated module is available that models the smart grid in a multi-resolution approach. Nodes of this grid can represent individual devices, households, generation facilities and whole neightbourhoods or cities. Data is collected from the nodes, which can provide measurements from real power generation and consumption, or simulate device behaviour. Based on this collected data, the power flows are approximated in simulation, and visualised accordingly. Devices can have reactive behaviors, specifying their control strategy as a function of market conditions and (possibly simulated) power flows. Their remaining control flexibility in turn can be the basis for market participation. Depending on the market design, nodes with flexibility may directly trade in the market, or their flexibility may be aggregated and the aggregator performs portfolio optimization towards the devices and offers the residual flexibility on the market. Market based solutions can be used to tackle complex scheduling problems, providing efficient allocations among several competing stakeholders with flexible power generation or consumption. Market Garden has been developed to facilitate the evaluation of market mechanism designs, bidding strategies and alternative market regulations both in simulation and experimental test environments. Market Garden is primarily a framework to facilitate research and testing in simulation and prototype environments. In order to get an intuitive impression, the underlying grid and market structure can be visualized using the interactive GUI. Take a look at the screencast video. The demonstration visualises a scenario in which a retailer aggregates prosumer flexibility, and interacts with power plants in a wholesale market and as a balancing responsible party with other flexibility providers (visualized as batteries) on a balancing market.